Webster University Library will host a variety of social events in the Library Conference Room this fall. Details, calendar links and registration details (where applicable) are below. All events are in the Library Conference Room at the Webster University Library located 101 Edgar Rd., 63119. 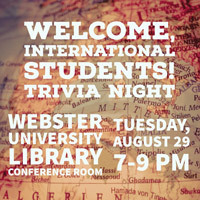 Webster University Library will welcome our international students with a a fun trivia night. Join us for games, snacks, and prizes! Tuesday, Aug. 29, 7-9 p.m. 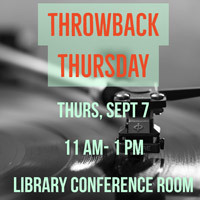 Throwback Thursday, Sept. 7, 11 a.m.-1 p.m.
Webster University students, faculty and staff are invited to interact with obsolete and forgotten technologies in the Library Conference Room. Typewriters, slide projectors, early computers and games are just a few of the items we will have on display. Attendance from all generations will encourage lively conversation! Registration is not required, but faculty and staff who wish to lend us items are encouraged to contact Sarah Reando, communications and outreach librarian, at sarahreando96@webster.edu. Thursday, Sept. 7, 11 a.m. - 1 p.m. Calendar details here. 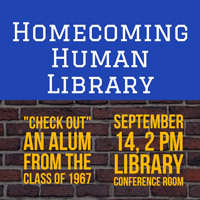 Homecoming Human Library, Sept. 14, 2-4 p.m.
Students are invited to come "check out" an alum! Explore campus with your new pal, or have a conversation. Alumni of any class who wish to participate are encouraged to contact Sarah Reando, communications and outreach librarian, at sarahreando96@webster.edu.